Council split 4-1, with dissent from Council President Lacey Beaty; Councilor Betty Bode, who has been ill, makes a personal appearance to support the ban and also argue for more help for homeless people. 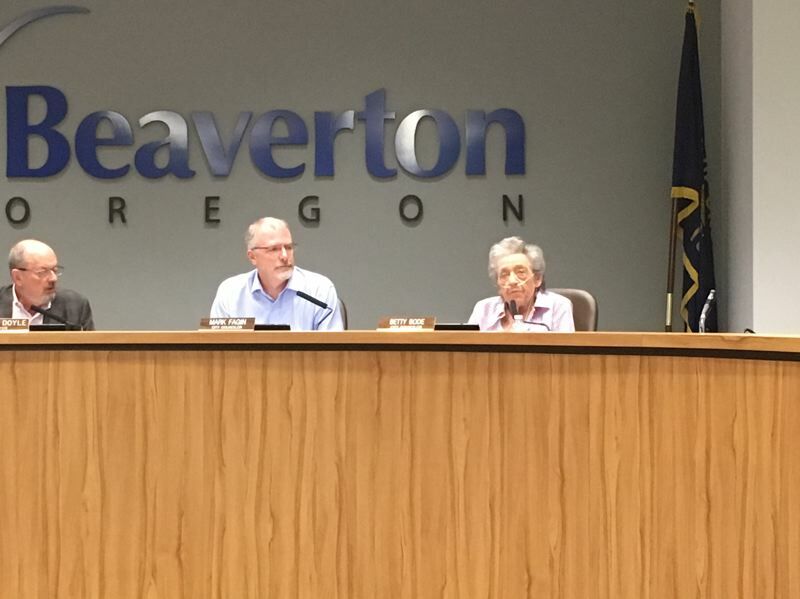 The Beaverton City Council, after hearing a third round of comments for and against it, voted 4-1 Tuesday to ban overnight car camping on city streets. The ordinance bans camping in the public right of way — camping is defined as setting up a temporary place to live — but require police to issue a 72-hour written warning to a violator for a first offense. Police would be authorized to tow vehicles only if a person has received a city ticket for violation of the ban within 30 days of the current violation. Maximum penalties are a $100 fine and 30 days in jail. Before the vote, the council heard comments for 45 minutes from 20 people, many who have spoken at previous meetings May 1 and June 5. 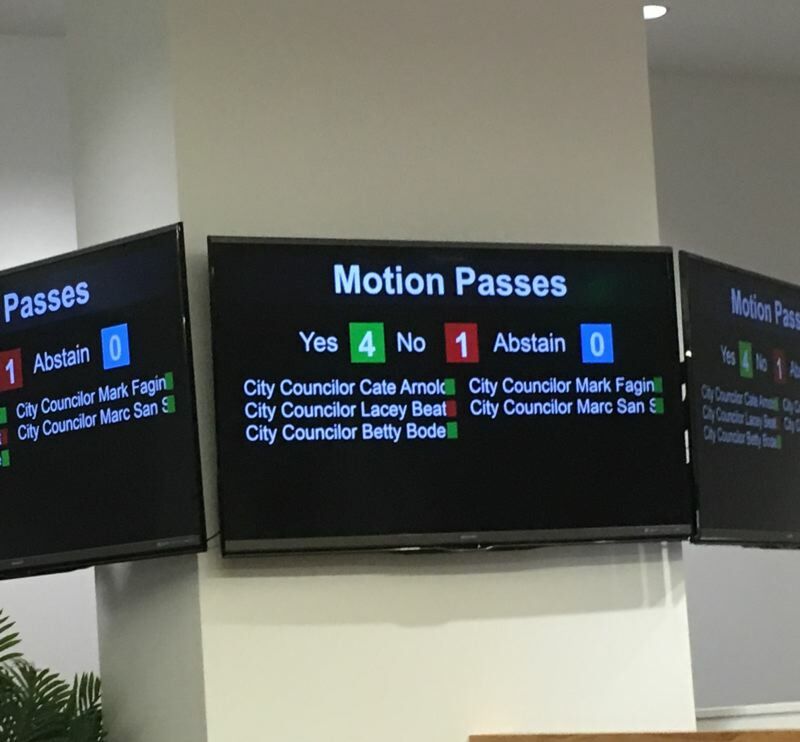 The issue has been before the council for months — and Councilor Betty Bode, who has been a champion of help for homeless people, came down in favor of the ban. "Camping on public property is not a form of housing," said Bode, who has been ill and had not attended a council meeting in person until Tuesday night. "I want this to be a welcoming city," she said. "But I want this to be a safe city — safe for neighbors, for families, for kids who go to school." Bode said community safety is not ensured by trash, human waste, and needles used for illegal drugs. The ordinance enables police to order cleanups of illegal campsites and store personal belongings for at least 30 days, unless items are unsanitary or hazardous. Police can keep weapons, drug paraphernalia, and items that appear to be stolen or are evidence of a crime. Bode has advocated use of city-owned property for overnight car camping. It's a variation of a two-decade-old program in Eugene, where the city pays St. Vincent de Paul of Lane County to screen people, who then can go to parking lots of participating businesses, churches and public agencies — although the property owners must provide restrooms and trash disposal. St. Vincent de Paul also provides links to social services. "If we do not go to the core issues of why people are homeless … we are just going to perpetuate this," Bode said. "It's going to be the people who can afford land against the people who don't have jobs. It has to stop at some point. We have to give people more resources." The lone dissenter was Council President Lacey Beaty, who said she could have supported the ban if some alternative were in place. "In the absence of that, there is no way on God's green earth I would vote for this," said Beaty, who mentioned that her husband, Ian — today an officer in the Oregon Army National Guard — was homeless when he was in high school two decades ago. She said he got help. "What we are telling our community today is that you have to go it alone. Don't be homeless. Move on to somewhere else," Lacey Beaty said. "I believe Beaverton is deliberately inclusive and we can do better than this." The other councilors supported the ban. Councilor Mark Fagin: "We are looking at ways that we as a city and community can take care of everybody who resides in this community. But safety is the most important thing. It's not safe for anyone to be sleeping on the street." Councilor Cate Arnold: "I will be supporting this, but I also will be supporting that we do more to find somewhere else for people to go and to make sure people have some opportunity to get the help they need." Councilor Marc San Soucie said the 2018-19 city budget, which is scheduled for final approval next week, contains money for police to offer motel vouchers for people seeking shelter — and for other steps to deal with a shortage of housing. Still, he added, "There is not a community in the United States that has solved homelessness. We can make a dent — a large dent — and take a big chunk out of it. We might even do a majority of it. But we're still going to be addressing people who have trouble dealing with their personal situations." Mayor Denny Doyle presides at most council meetings but does not vote. Summer Beaverton Farmers Market opens May 4, 8:00 a.m. – 1:30 p.m.